A journalist recalls her interviews with Katharine Hepburn, casting new light on the legendary actress. In 1942 Kate asked Spencer Tracy to co-star in her film Woman of the Year. ©CinemaPhoto/Corbis. My first meeting with Katharine Hepburn occurred in the fall of 1983, soon after I began writing on the arts for The Wall Street Journal. I learned that Anthony Harvey, whom I had met in London, and who had won accolades for directing Hepburn in The Lion in Winter, was now working with her on The Ultimate Solution of Grace Quigley, a dark comedy about an eccentric elderly woman who starts a suicide society for octogenarians. I knew that Hepburn was still very particular about talking with the press, so after receiving an assignment from The Journal, I called Tony. Tony asked me to write a letter to her, which he would then forward. A few days later he called me, irate: “If you want the interview, you’d better spell her name right!” Alas, I had spelled Katherine with an “e” instead of Katharine with an “a”—an egregious mistake that, he said, would have turned her against me immediately. Later I learned that whenever fans misspelled her first name, she would put a big circle around the misspelling and return the letter to the sender. However, my revamped letter worked, and I was granted one of only two interviews that she would do. When I finally arrived at her townhouse on East 49th Street three months later, I was more than a little nervous; her reputation for being cantankerous with reporters was well-known and the long wait for the interview hadn’t helped. When I rang the bell, an elderly woman with gray hair and bushy eyebrows immediately came to the door. Phyllis Wilbourn was Hepburn’s confidante, personal assistant, and companion who came in every day, but lived in her own apartment. Dowdy, pleasant, and efficient, Phyllis immediately sent me up a steep set of stairs to the sitting room, where Hepburn was waiting. I had always imagined Katharine Hepburn as tall and elegant. That’s how she looked in the Tracy/Hepburn comedies, where she always seemed to stand on an equal footing—literally and psychologically—with Spencer Tracy. But when I entered the modestly decorated room, I found myself staring at the back of a small woman stoking a fire in the fireplace. Her gray hair was piled loosely on top of her head; she wore khaki slacks, a white turtleneck sweater, and a black short-sleeved jacket. Even though I am only 5’5″, I seemed to tower over her, a feeling I found discomfiting, since in my mind she was not only tall, but a giant. We both laughed, and that seemed to break the ice. Minutes later, she called her good-natured cook Norah to bring us coffee and cookies. Despite my anxieties—perhaps due to them—the interview went very well and lasted two hours. From the first words she spoke, Hepburn had a mesmerizing effect on me; each sentence seemed charged with drama. This was not just an interview; this was a private performance. She chatted endlessly and easily about her childhood, her adoration for her parents, a subject she returned to often, her views on women, her years at Bryn Mawr, and, finally, Grace Quigley, her upcoming film, which she described as a comedy in the “Guinness” tradition. When I timorously mentioned Spencer Tracy, she abruptly snapped, “Spencer is a friend, and that is all.” Even though Spencer’s wife, Louise, had died the year before, she was still wary of talking about their clandestine relationship—at least to me. I wanted to dissolve into the couch. But she quickly forgot my remark—as I would later learn, she was quick to forget and forgive. When her phone rang, she answered, but said she couldn’t talk because she was in the middle of “an important interview.” Unlike many other actors I’d interviewed, she was totally focused on our discussion, and conducted the conversation with the same professionalism that she would use during rehearsals. She knew she was fascinating and that I was fascinated by her. After The Journal published my article in February 1984, I called to request a follow-up interview for McCall’s. Kate told me that while she hadn’t read my article—because she never read pieces about herself (“Quite inadvertently,” she said, “you will write something that will turn me off”)—the people around her said that the profile was very good. (I recently learned from her niece Katharine Houghton, who played the role of Hepburn’s daughter in Guess Who’s Coming to Dinner? that this was hardly true: Hepburn read everything that was published about her, and this was her way of saying that she liked my article.) She then agreed to the interview. Nick Nolte and Katharine Hepburn on the set of Grace Quigley. ©John Bryson/Sygma/Corbis. At one point she leaned forward, asked me to turn off my tape, and confided that when she was in her sixties and Spencer was out of work due to severe health problems, she left her career to take care of him. The picture offers she was getting, she said, were not all that great and she knew that if she was working and Spencer wasn’t, it would be the end of their relationship, and possibly the end of Spencer. So they retired to their small cottage on the property of George Cukor, a close friend who had directed their early comedies. There Kate learned to paint, take care of the house, cook for Spencer, and she sat by him nightly to make sure he slept soundly. 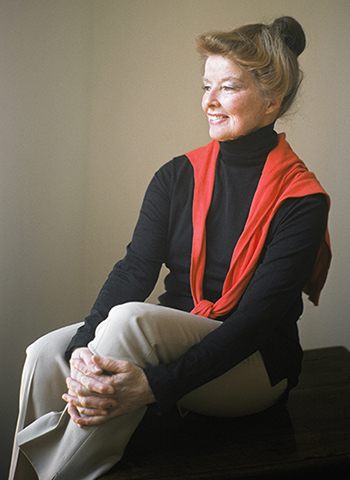 Katharine Hepburn in her home in Fenwick, Connecticut, October 1981. ©John Bryson/Sygma/Corbis. Before leaving, I told her that I would like to work with her on her autobiography. She was silent for a few minutes, and then she said, cagily, that she would think about it. It was a strategy, I surmised, to restrain me from doing an unauthorized book on her, since (unbeknownst to me) she was already working with the biographer Scott Berg. Perhaps she wanted to keep me at bay in case the project with Berg foundered. Instead of a book contract, she offered to give me an autographed photograph. I selected a black-and-white photo that didn’t show up her signature well, but somehow Kate always looked more natural to me in black-and-white than in color. I left, carrying it along with a box of brownies that Norah had baked. A few weeks later I called to ask for pictures from her personal collection for the McCall’s article. “Tell your editor there are hundreds in stock houses. Use those,” she said emphatically. Undeterred, I tried a new tack. “I’m only doing my job,” I said, hoping that she would relent. After all, she had often told me that the world was ruled by the strong—not the weak—and that if you go up the mountain, don’t stop halfway because you are tired. The strategy worked, and she told me to come over the next morning. It was a Friday—two days before I was leaving for a month’s trip to China—and it was raining, so I wore my green Burberry raincoat. When I entered the house I laid it on a hallway bench, then went into the living room with Phyllis to select photos. I was still poring over images when Phyllis and Kate left for the Hepburn family house in Fenwick, Connecticut, where they went every weekend. Norah, who had taken a liking to me, stayed while I finished and gave me lunch. When I was ready to leave, my raincoat was nowhere to be found. Norah panicked, and then concluded that Kate had swept it up with a pile of other clothes lying on the bench and taken it to Fenwick. No matter, I told Norah. “But you’re going to China on Sunday,” she reminded me. “You’ll need a raincoat.” She ran upstairs, returning with a paper-thin green army poncho that had a cigarette hole in the corner. She would hear no excuses and folded up the poncho, assuring me that “Miss Hepburn” (Norah never called her Kate—and neither did I) would want me to have it. Of course I told everyone in my tour group that I was traveling with Katharine Hepburn’s poncho. And when it rained during our trek on the Great Wall of China and I wore the poncho, all their cameras flashed. As soon as I returned to New York I took the poncho to Kate’s house, offering to exchange my raincoat for the poncho. No way! She had had my raincoat dry-cleaned and she would not part with the poncho. But she thanked me for the photo of her poncho on the Great Wall of China that she had always wanted to visit. McCall’s planned to publish the 4,000-word article with 21 photos from her personal collection in November (see slideshow on first page). However, Grace Quigley opened and closed before the issue would hit the newsstands. To give the article a news peg, I discovered that according to all printed biographies she would turn 75 on November 8. So my editor ran the article with the title “Kate at 75.” But he ran a lackluster actor as the main cover image instead of Kate. I was, of course, furious. During the fall of 1987, I learned that Kate was about to publish her first book, recounting her experiences making The African Queen with Humphrey Bogart. By then I was writing frequently for The New York Times, and easily snagged an assignment. The feature ran on page seven of the Arts & Leisure section, and this time I received an angry call from her publicist. “Why wasn’t Kate on the section cover?” she screamed. Katharine Hepburn at home, October 1981, Fenwick, Connecticut. ©John Bryson/Sygma/Corbis. In the fall of 1989, McCall’s unexpectedly contacted me to do a feature celebrating Kate’s 80th birthday. It would be my fourth and final interview with Hepburn. In preparing for our meeting, I stumbled on a biographical entry stating that she was born not on November 8, 1909, but May 12th, 1907. When I arrived at her home, I confronted her with this almost immediately. “If you’re so interested,” she snapped, “Go up to the records in Connecticut and look it up.” Obviously I had hit a nerve, and knew her well enough by this time not to pursue the point. So I quickly switched gears and we continued, but not with the same gusto that I had experienced in earlier talks. It was not until her memoir Me came out in 1990 that I learned the truth: She was in fact born on May 12, 1907. The birthday she had claimed as her own was that of her older brother, Tom, who was born on November 8, 1905. Kate adored Tom and during Easter week in 1921, they visited an aunt in New York City. Tom, 16, slept in the studio attic; Kate, 14, slept downstairs. The following morning Kate went upstairs to wake Tom and she found him lifeless; he had hanged himself from a rafter using a piece of a torn bedsheet as a noose. Although few biographers have commented how this early tragedy impacted her later life, it seems likely to me that her deep attachment to Tom, and her subsequent guilt for failing to rescue him, triggered her many relationships with men who were flawed and needy. The most prominent of these was Spencer Tracy, an alcoholic, tormented by the birth of a deaf son and a loveless marriage to a woman whom he could not divorce. Only in films—a world of make-believe—could she allow herself to be the enticingly arrogant woman who ultimately succumbed to the pragmatic charms of a man who could put her in her rightful place. Only in films could she marry Tracy, satisfying her compulsion to rescue him. But Tracy was not the only flawed man in her life. 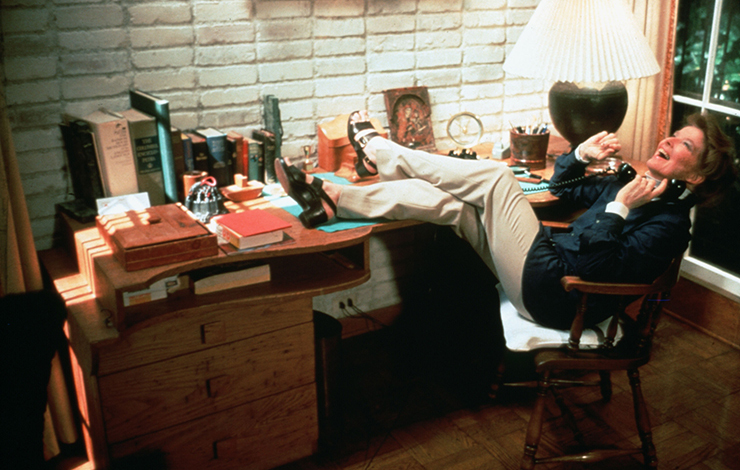 The larger-than-life Howard Hughes, her early love, was mentally unbalanced. And, in her later films, she often played out scenarios, real or fanciful, of rescuing troubled men. In The Philadelphia Story she plays a socialite who remarries her philandering husband. In The African Queen she plays a spinster who cures—and marries—an inveterate alcoholic. In The Lion in Winter she is married to a demented king who locks her up in prison. Both on screen and on stage her most memorable characters seemed to be about herself or her fantasies. Whether or not Kate was conscious on any level of her demons, the lingering guilt and confused sexuality she experienced as a young girl eventually manifested itself in her forging a persona that was neither typically female nor typically male. Through her incredible screen personality and her unique combination of sass and class, she excelled as an actress, become a national icon, and controlled the press, of which I was, for better or worse, a member.